Increase the life of your plants of your worlds or biomes with this mod. 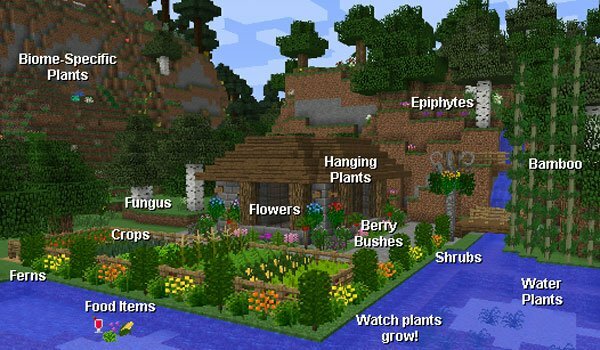 Plant Mega Pack 1.7.2 and 1.7.10 is a mod that adds the incredible amount of over 400 types of plants that we will find as we explore the various Minecraft biomes, as these appear depending on the biome. There are different kinds of plants, from water ones, to climbers ones and even damaging plants. All these plants are well adapted to the graphic line of the game and it respects the zones where they usually grow, because all of them are plants that exist in the real life. This new wide variety of plants also allows us to make new crops and edible items. How to install Plant Mega Pack Mod for Minecraft 1.7.2 and 1.7.10? Lots of new plants for Minecraft!